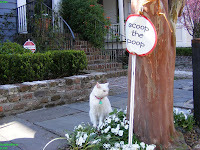 Charleston is now revving with visitors from all over the world, eager to experience the city’s rich history, amazing architecture and exquisite gardens during the month long Spring Houses and Gardens Tours. 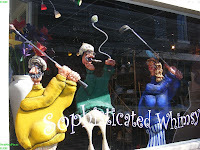 Those of you that plan to hang around a little longer please stop by “Sophisticated Whimsy” on Broad Street and “indulge in some free putting lessons” from the town’s best golfers. At least we can all agree they are very well dressed! Happy Travelling in South Carolina! 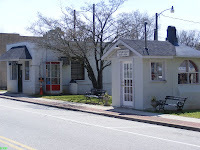 Ridgeway, South Carolina is home to the world’s smallest police station. 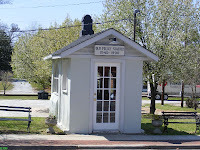 Originally built as a watering station for horses, it served as Ridgeway’s police station from 1940 to 1990. It’s as big as a toll booth! If you’re lucky (or just plain smart!) to travel on scenic highway 34 on your way to Myrtle Beach make sure to check it out. In case you are wondering, Ridgeway boasts one of the lowest crime rates in the state and the nation. Travel tip #1: Make sure to go way below the speed limit (25mph) as you’re driving through Ridgeway. You can thank me later. 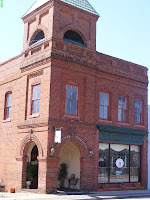 If hungry, go to the Olde Towne Hall (can’t miss it, the big red brick building near the police station). The restaurant is located in the original Town Hall whihc was built in 1904 and it still has some of the jail cells in the back. The food is just good ole country cooking: plenty, juicy, meaty and delicious. The chicken wings are “made in Heaven” and the raw fries will bring you to tears (in case you must share). Travel tip #2: Keep kids entertained by asking them to guess the numebr of Target trucks that will go by. This works best during dinner time. Believe it or not one dinner during Christmas week we counted 6 in row! Only in South Carolina backcountry in the little town named Ridgeway…the center of discount retailing! 4:45 AM and it’s pitching dark outside. Pulling out of the driveway almost ran the car into the ditch…guess I’m not awake yet. Minutes later, first time ever, I miss the right turn onto 200 SC highway that joins I-77 towards Charlotte airport. 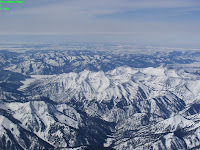 Yep I’m on my way to a long awaited ski trip to Jackson Hole, Wyoming. Even got me new skis, bindings and boots for the big event. At the Delta checking line, a tall young looking lady visible distressed, lets out an “Oh, no!” as she reluctantly pulls away from the ticket counter. The Delta service person instructs her to go to the “helpline” and wait there. The “helpline” it’s by the smart cart area but nobody is there to “help”. By this time our passenger is in full crying mode and talks frantically on the phone. Till this date I don’t have a clue what happened. Finally I’m through the security line torture and looking at the information screen can’t help to notice the gate mismatch between the ticket and the screen. “Dazed and confused” I’m now convinced that anything is possible. I’m trying to kill some time browsing the bookstore next to Starbucks. “Things men wont tell you that you need to know”…that should be an interesting read…flipping through pages I learn that “your husband wants to be your hero”, “men are color blind…don’t ever ask him to choose between purple and mauve” and “first thing your husband wants to do when he gets home from work is to take a leak…please ladies no sob stories about the kids, laundry or the neighbor next door”. Mental note to check this out later. All right, we are boarding! Grandpa, mom with 2 months old Sally and a 4 years old Sammy have taken the whole row including my seat. Actually that’s not too bad. I’m taking grandpa vis-à-vis aisle seat and start reading the Backpacker magazine I bought a little earlier. I’m immediately drawn to the “Shock and Awe” cover story about two severely wounded Iraq veterans trying to make piece with themselves climbing Mt. Rainier. One is an amputee, the other is blind. The next 30 minutes are an emotional roller-coaster: tearing up reading about the amputee soldier Dunking Donuts encounter with a little boy saying “I prayed for you” and laughing at the home made Valentine Cards he received in Iraq from school kids “To soldier’s for fiting are cuntrey…Hope you fell beteter!” He’s all jollied over “fell”. Turns out he didn’t make it all the way to the top but his fellow soldier did. “Snack or food?” the flight attendant interrupts. As I give no response she asks again…I mumble “Yes”. “Well which one is it?” she responds patiently. You can tell she is well seasoned. In fact her tag reads “Leader”. From the nicely designed brochure handed earlier I knew “food” meant $5 sandwich; same stuff we used to get for free not too long ago. Intimidated I manage a weak “snack please”. Passing the “food” I wonder what the snack will be. Cheese crackers; that works. As I’m “indulging” with the crackers can’t help scanning the computer screen one seat ahead. The guy is dutifully doing his email chores. Title reads “PDF not approved and not OK!! !” Ouch! A rebuttal with three exclamation points… that’s gotta hurt. He’s obviously responding to this abomination by pouring in well thought arguments on a page long reply most likely no one will read. “Becoming Jane” movie it’s over, thank God. We are back starring at the Google-like earth map showing our flight trajectory. There is one dot on the map that reads “Last Chance” over what looks like Colorado. Can’t really get off the plane so I try to ignore the irony and return to my magazine when it happens. Eleven little words catapult me into a hysterically uncontrollable laugh. “Daisy can’t help it: She farts, and the planet gets warmer.”…It’s about small businesses’ creative ways to address global warming, in this case capitalizing on the cow’s perpetual flatulence. My seat mates are amused at first then they get visible annoyed. Tears falling and coughing out loud, hands clapping and with my entire body jerking back and forth I just can’t put a stop to the heresy. “Are you OK?” asks the Leader. I can only point to the culprit article. You can tell she doesn’t get it. I knew the second leg of the trip, from Salt Lake into Jackson Hole, was a very short flight so not much can happen, right? Wrong. Just as I was putting my seat belt on, the guy sitting on the aisle seat leans over: “You know this is the same [type] plane they crashed into World Trade Center…it says so in the paper”. Dumbfounded I just nod my head. Never had flight phobias before (unlike my husband who few years back had his mom come over to Germany to pick him up ‘cause he couldn’t fly back home alone) but that just puts me upside down. 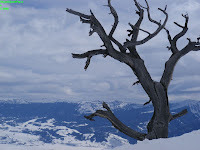 I grab my digital camera and get busy capturing the scenery. The rest of the flight is uneventful. 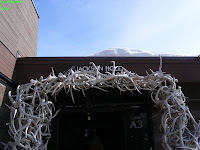 Passing thru the antlers decorated airport entrance surrounded by the magnifice nt Grand Tetons Mountains I feel right at home. Waiting at the slow moving and airport’s only baggage claim area I wonder if all that happened that day was just a coincidence. As newly self-proclaimed travel writer and photojournalist, maybe am I now more aware and prone to seeing things, rather than just strolling by from dusk to dawn without a clue on how I spent my time. Either way, something is about to happen. I gather my stuff, take a deep breath and exit the airport heading for the bus stop. One summer evening we were coming home from school. 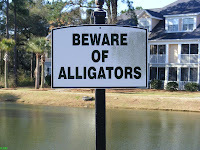 As I was turning the car around the dolphins’ water fountain I caught sight of a 5 feet alligator sunbathing on the little pond beach across the parking lot. I stopped the car, yanked Lana from the seat, and with her in my arms ran the two flights of stairs up to the apartment and grabbed the camera from the kitchen drawer. Thank God it had batteries! Ran downstairs (Lana still in my arms) and looked anxiously at the pond. The impenetrable beast didn’t move an inch. Can’t tell why I got so excited. We’ve seen plenty of alligators before, on the Louisiana swamp tour, at the Alligator Land in Myrtle Beach and just recently at the Riverbanks Zoo. Vivid images flashed in my head of back-breaking tons pressure jaw snapping monster that could swallow you whole in an instant. As Lana was getting restless trying to get a better view of the “crocodile” I decided it’s time to find shelter inside. A month after I moved to Daniel Island I was struggling with the groceries bags. What looked like a bicycle tire laying 3 feet ahead right by the handicap parking started to move slowly towards the apartment building. It was a snake and it was big. Fascinated, I just froze and didn’t even put the bags down. The snake glided through the grass unfazed. Seconds later it was swallowed by the earth in the dusky light. I kept starring waiting for some drama to unfold. Nothing else happened so I reluctantly headed for the stairs. There were plenty of bags left in the car so I had to come back twice. Each time looked anxiously around tiptoeing and hoping my way around through the breezeway. With no sign from my reptilian friend, I was equally relieved and disappointed. Weeks later my mom and my 3 years old were coming back from the Children Water Park when they ran into another snake. This time there was no mistake about it. He was stretched along the road right in front of the Bistro. Maybe he was in for the dinner special. I’m surprised it wasn’t run over by the many cars passing by. My mom and Lana quickly turned around and took the long way home. This February got a new digital camera, a S700 Fuji FinePix, with 7MP, 10x optical zoom, image stabilization and many other features I’ll probably never use. Thrilled to try my new toy went out for a stroll on the peaceful walkway around the Wando River. On the little bridge in front of the apartments I ran nose to nose with a great white heron. He was magnificent and he knew it. Like a pop diva he let me shoot at will. He even turned around for a close-up. Bet that’s his good side! Bored by my amateurish maneuvers he finally takes off. Few days later I met its cousin the great blue heron. He was resting by the famous alligator pond. Lana knew the drill and we ran inside the apartment and both brought our cameras. 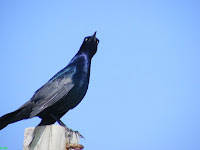 I got a great shot as he was fixing to take off. It was late at night. I just passed the Seven Farms and River Landing intersection and could see the lighted oak tree welcoming me home once again. All of the sudden a dog jumped in front of the car and headed into the fields by the fire station. Hmmm…a stray dog…that’s really strange on Daniel Island. I’m glad I didn’t hit it. Never had a road kill before and sure didn’t want to start one now. 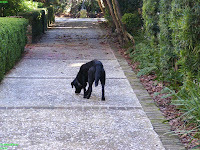 Then the “dog” turned around and stopped about 30 feet away. He looked right at me as the car headlights were shining on his golden fur coat. At this point I realized it wasn’t a dog but a coyote. I stepped out to get a better look, expecting him to take off any minute. Three more steps. We starred at each other for what seemed like an eternity. He had an inquisitive and melancholic look, not at all afraid but rather curious. A strange sensation of guilt washed over me. The car, the offices, the road and even the lighted tree, all seemed out of place. I turned around feeling uneasy. During my short stay on Daniel Island I was blessed with more wildlife encounters than in all the years I’ve lived in United States. This place is truly special. They’ve welcomed us into their home and seemed to have done a good job so far keeping the place intimately warm. We are the trespassers, so let’s gracefully accept their challenge in making the island a “home sweet home” for all. All we need it’s to smile out. We were all starring at him as he was fiddling with the bamboo leaves and stick. This was a rare treat indeed. The big boys out in plain view less then 4 feet in front of us. Out of the blue Mike raises the stick in the air gladiator style and lets out a shivering holler. He looks menacing as he approaches the crowd. No one dares to make a move. Then without reason turns around and charges at Chalka. Did he just hit him in the head? Chalka, the alpha male and pack leader, refuses to fight and slowly heads up for the hills. As we say back in Romania “the wise man cedes first”. Flabbergasted I try desperately to set the camera on video and hope to capture something. Too late; everything is back to normal. Or so it seems. This is the moment we all secretly hoped for. A full force display of the “800 pounds gorilla” in thriller motion. Enough with the melancholic stares, mindless fruit and leaves picking and the occasional eye contact piercing Darwinian guilt into your brains. We wanted action! “Be careful what you wish for”…a recent National Geographic article – “Minds of their own” clearly demonstrates we are not the only intelligent specie on this planet. And yet although we were only separated by a thin fence I felt we were worlds apart. Turned around and left with a sour taste in my mouth.